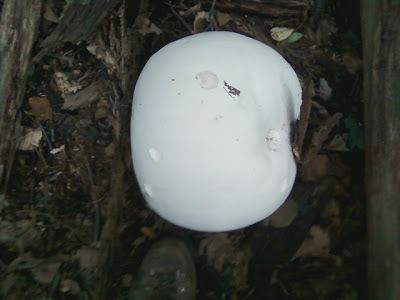 Wikipedia says the giant puffball (Calvatia gigantea) is similar to tofu when cooked. There are several of these erupting around town. Chicken of the woods (genus Laetiporus) supposedly tastes like, you guessed it, chicken. I think that's because it's kind of tough and flavorless. I nibbled on some of this one and while I didn't go into kidney failure, I do think it would have been better sauteed in butter with a little garlic. Chicken of the woods needs to be very fresh and young. Otherwise it gets woody and less chickeny. And, yes, you want it sauteed in butter with garlic. 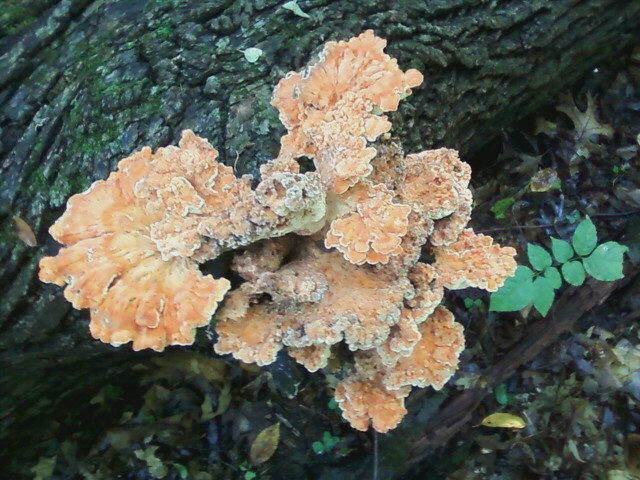 Via Twitter @LocalInAnnArbor: I don't think that is Chicken of the Woods - prob what used to be Polyporus sulfureus. Good when cooked in butter (tender part).